It is now standard practice for most companies to issue ID cards to staff for security purposes. These cards are no longer just used for identification purposes but can be used to restrict or grant access to certain areas, or even for on-site purchases. Essentially ID Cards can be used anywhere that needs a simple and effective way to identify and verify staff credentials or control access to certain areas of a building. A perfect example of this would be a Hospital. With the rising ubiquity of ID Cards, many businesses take it upon themselves to print their ID cards as and when they need them. This results in a cheaper more efficient system for ID issuance. 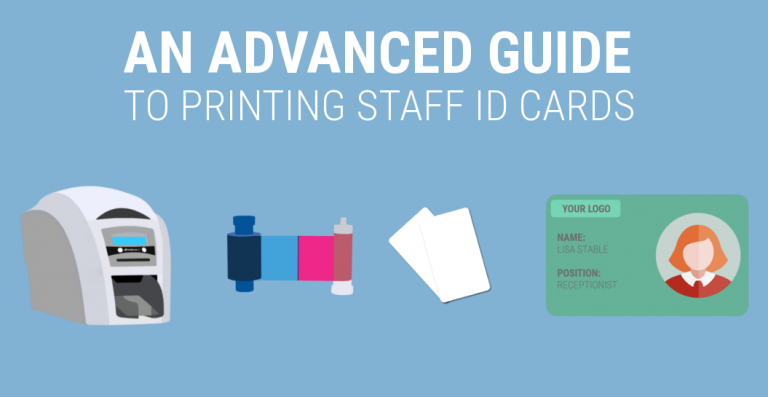 Our advanced guide will outline everything you need to know to start your very own in-house printing bureau. Before you begin, it’s best to have a clear outline of what it is you need from your ID Card program. Will you have basic text only cards or full-blown dual-sided colour cards with smart chips? The answer will ultimately affect your choice of printer. How many cards will you need to print on a monthly basis? Will you print single or dual-sided cards? Will your cards require additional security? Will you need high-definition quality? Will your cards be used for access control? Now that you know the questions, let dive into finding the right printer. There are two main types of desktop card printers: Retransfer and DTC(Direct-to-card). The main difference between the two is quality. A retransfer printer offers a much better print quality, but of course the caveat being it’s much more expensive. DTC card printers are usually more than adequate for most print applications but for those wanting the very best quality Retransfer printing is a must. Most manufacturers have a base model which is limited and often restricted to printing single sided cards only. If you need to print large batches of dual-sided cards a dual-sided printer is a valuable upgrade. Please note, it is still possible to print on both sides with a single sided printer, it just requires you to manually feed in the card twice. Another factor to consider is card encoding. Encoding allows you to add additional functionality to a card. Encoded cards are often used for access control or time and attendance. If you use any kind of access control system in your building, then you will need a machine with an encoder. Most printers come with a USB connection as standard. However, this limits the use of the printer to one dedicated machine. For many businesses, this isn’t practical. However, most printer models do offer a networking option for their machines. If you print a small volume of cards (1-10) per month, a base model single-sided printer will usually be more than enough for your needs. Most can be configured with encoders if needed. If your printing dual-sided cards in batches, it may be worth upgrading to a dual-sided model as this will significantly reduce the manual effort of feeding in the cards one-by-one. If quality is your main concern, then you should opt for a retransfer printer as the print quality is significantly better on this type of machine. Retransfer printers are much more expensive to buy and run than traditional DTC desktop printers but the difference in quality is quite profound. These are the main points that you should bear in mind when shopping for your ID Card printer. At the fundamental level, they all perform the same action i.e. print cards, but if you are not careful you could end up overspending on features that you don’t need. For further information on ID Card printing or to buy a card printer, you can consult a retailer such as CardLogic Just be sure to keep the above points in mind.